Today is March 17th–St. Patrick’s Day–and when this special day rolls around, everyone wants to be Irish; or that certainly seemed to be the case when about 200 students, coaches, and judges came to NDSU for the 4th Annual NDSU Lions Speech Tournament sponsored by the NDSU Club, the Dakota National Forensic League Club, and the NDSU Department of Communication. Most participants wore green, but if they didn’t they got a shamrock to wear as they proceeded through two prelims and final rounds if 14 different individual events. 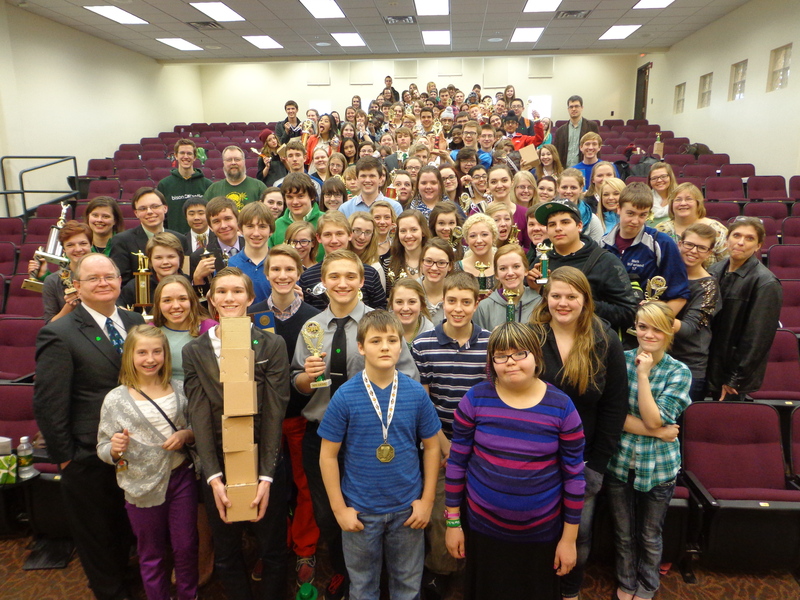 Speech teams from ND helped Lions raise over $2,000 for student scholarships! This signature service project for the Dakota NFL Lions Club gives dedicated teachers the opportunity to come together as Lions to sponsor an event that provides scholarships for students who have qualified to participate in the National Forensic League’s National Tournament. All registration and judging fees, as well as awards are donated. In addition to the high school scholarships, the Dakota NFL Lions Club this year will provide scholarships for two college students to compete at the Insterstate Oratory Competition; and donate to the LCIF Development Fund, building toward its first Melvin Jones Fellow. 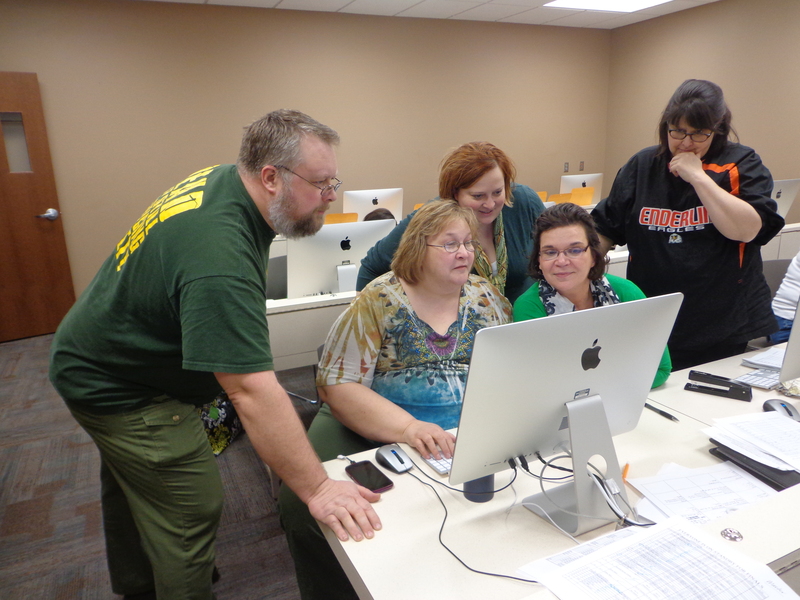 (L-R) Lions Brian Geffre, Gayle Hyde, Denise Johnson, Yvonne Kalka, and Terri Egan check tabulations before finals. I have known and worked with these teachers and coaches for over a decade–some for longer, as some of them were my students, and all are among my inner circle of friends–and it seemed a natural for me to invite them to be among the first members of the Dakota NFL Lions Club when the club formed during my term as District Governor. They are models of service and it is exciting that many of them will be coming to their first MD5 Convention in Watertown. Enjoying the moment with my student who has a heart as big as a pot of gold. 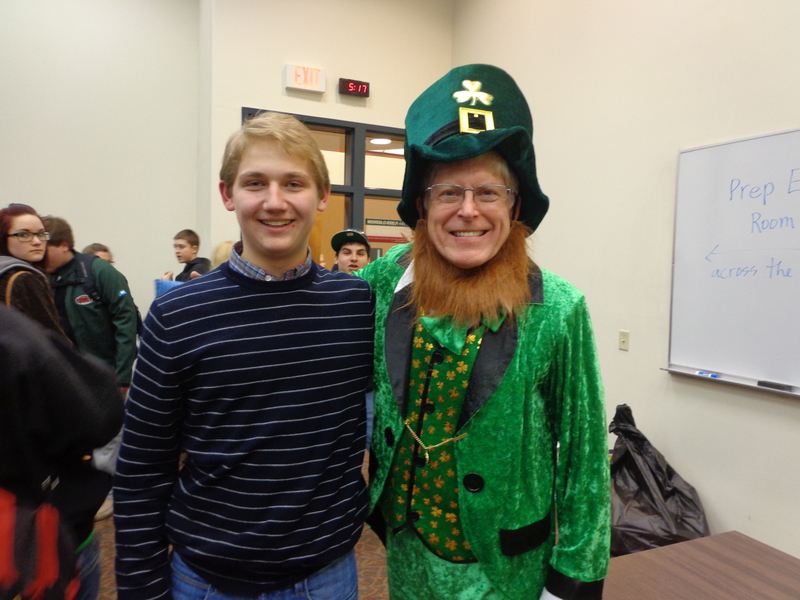 Of course, with the tournament falling on March 17th, it seemed only natural that I would don the leprechaun; and when the students observed my willingness to enjoy the moment and get into the spirit of the day, they responded in kind. Everyone had a fun time! But, the day wasn’t just about competition. The NDSU Lions Club collected 103 items for the FM Food Pantry and raised $133 for its project fund. As I reflect on the day, I am so thankful that I have the opportunity to work with students and encourage them to grow in their professionalism and competence as speakers and citizens. These are the young people who will change the world; and being part of that is humbling and inspiring to me. Everyone’s a little bit Irish on St. Patrick’s Day; but the teachers and coaches who made this tournament a big success for the students who participated are real Lions–100 percent!